Today´s brands need to stand out to be recognized. With custom uniform pins, airline carriers and corporate brands are able to add a personalized touch to their uniform appearance, while also setting them apart from the competition. The traditional pin-up referred to drawings, paintings or photos hanging on the wall and displaying the latest trends in fashion. Custom uniform pins follow suit. 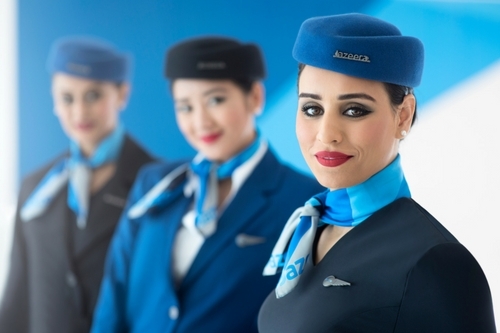 They decorate the uniform and show off the newest trends within aviation fashion. Pins and wings are the little things that make a big difference. They personalize the look and allow brands to stand out from the competition by promoting brand insignia. Qatar Airways´ tie pin delivers on all the points above; it adds a personal touch while also making the marketing department happy by including the company logo; the Oryx. Less is more? Bigger is better? Or somewhere in between? A universal answer is hard to come-by as a one-size-fits-all approach is not an option. Every brand is unique. The uniform needs to showcase that. Qatar Airways have gone for the subtle approach, stylishly mixing the gold-covered tie pin with a dark grey jacket, white shirt and burgundy tie to complete their male cabin crew uniforms. It works for Qatar Airways, but might not work for all brands. Our experience says it won´t. SAS have opted for the traditional look and added their name to a plain, silver-covered tie clip. Atlantic Airways have chosen a small pin featuring the company logo. In contrast, the below pin belongs to a brand in the food industry and the design is big and bold, deciding on a shiny gold-colored knife and fork that stands out, however quirky it might be. The takeaway is to align the design of your custom pin to match your brand and industry. Go big and bold if that defines your brand and company culture. Choose a more subtle approach if that fits your corporate DNA. Star Air have done the latter. They use the company logo on a single-colored background to highlight brand insignia. Icelandair follow suit on their tie clips, although in a more discrete fashion. To conclude the world tour of uniform pins, we look at Jazeera Airways. The Kuwaiti carrier uses a variety of flight pins and wings, which emphasize the company name. The dark metal hatpin features on cabin crew hats, while the gold-colored pin decorates cabin crew coats. With crews walking through the airport daily or commuting to and from flights, this is a great way to brand your company. Creating the perfect pin is more than focusing on design and size. You also need to think about functionality and ensure that locking mechanisms work as intended to make sure the pin does not face downward. Further, if following the example of Jazeera Airways, you should focus on the shape of your custom pin. Your pin should follow the contours of the hat and bend slightly inward for the best result. See our blog post on custom pilot wings for examples and more need-to-know tips for wings and pins.